85 • Greyscale 2014 Merlot, Oak Knoll District, Napa Valley 14.7% (USA) $44.00. 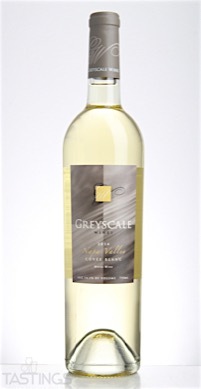 86 • Greyscale 2014 Cuvée Blanc, Rutherford, Napa Valley 14.5% (USA) $34.00. 93 • Greyscale 2013 Cabernet Sauvignon, Rutherford, Napa Valley 14.7% (USA) $65.00. 86 • Greyscale 2014 Cabernet Sauvignon, Rutherford, Napa Valley 14.7% (USA) $65.00. 85 • Greyscale 2015 Cuvée Blanc, Rutherford, Napa Valley 14.7% (USA) $24.00. 93 • Greyscale 2015 Merlot, Napa Valley 14.7% (USA) $44.00. 86 • Greyscale 2016 Cuvée Blanc, Napa Valley 14.5% (USA) $27.00. 95 • Greyscale 2016 Cabernet Sauvignon, Rutherford, Napa Valley 14.7% (USA) $65.00. 90 • Greyscale 2016 Merlot, Oak Knoll District, Napa Valley 14.7% (USA) $44.00. Greyscale 2014 Cuvée Blanc, Rutherford, Napa Valley rating was calculated by tastings.com to be 86 points out of 100 on 8/6/2016. Please note that MSRP may have changed since the date of our review.